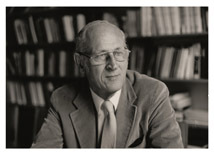 Lawrence Stone (1919-91) joined the Princeton History Department in 1963, where he served as its chair during 1967-70, and from 1968 until his retirement in 1990 he was the founding director of the Shelby Cullom Davis Center for Historical Studies. Born in Epsom, UK, he was educated at Charterhouse, Sorbonne, and Oxford. He taught at Oxford from 1947 until he moved to Princeton, where he flourished and became one of the world’s leading historians. He was that rare historian whose deeply researched studies were appreciated by scholars and the general public alike. His works, along with those of Eric Hobsbawm and EP Thompson, redefined and reshaped the field of social history. He founded The Davis Center to stimulate intellectual exchange both within the History Department and between the department and visiting scholars from the United States and abroad. Under him, the Center research seminars developed the reputation as one of world’s most innovative, cutting-edge, and rigorous venues for discussion and debates on historical issues and methods. Dynamic, rigorous, and never one to shy away from intellectual controversies, he made history interesting and exciting, and opened fresh territories of historical research.